Food and nutritional securities are the major threats coupled with declining factor productivity and climate change effects in Nepal. Maize being the principal food crops of the majority of the hill people and source of animal feed for ever growing livestock industries in Terai of Nepal. Despite the many efforts made to increase the maize productivity in the country, the results are not much encouraging. Many of the maize based technologies developed and recommended for the farmers to date are not fully adopted. Therefore, problem is either on technology development or on dissemination or on both. Considering the above facts, some of the innovative and modern approaches of plant breeding and crop management technologies to increase the maize yield need to be developed and disseminated. There is a need for location-specific maize production technologies, especially for lowland winter maize, marginal upland maize production system, and resource poor farmers. Research efforts can be targeted to address both yield potential and on-farm yields by reducing the impacts of abiotic and biotic constraints. 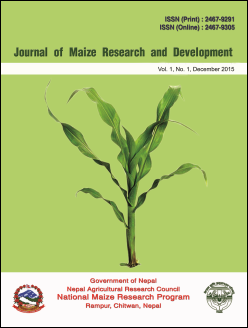 Therefore, in order to streamline the future direction of maize research in Nepal, an attempt has been made in this article to highlight the present status and future prospects with few key pathways.